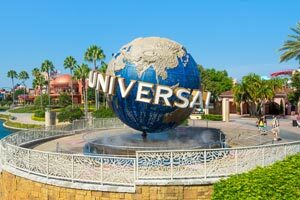 Located in Orlando, Universal's Aventura Hotel is within a 15-minute walk of Universal Studios Florida™ and Universal CityWalk™. This family-friendly resort is 1.1 mi (1.7 km) from Hollywood Drive-In Golf and 1.2 mi (2 km) from Universal’s Islands of Adventure™. Make yourself at home in one of the 600 guestrooms featuring refrigerators and flat-screen televisions. Complimentary wireless Internet access is available to keep you connected. Private bathrooms with showers feature complimentary toiletries and hair dryers. Conveniences include safes and coffee/tea makers, and housekeeping is provided daily. Take advantage of recreational opportunities offered, including an outdoor pool, a spa tub, and a fitness center. This resort also features complimentary wireless Internet access, an arcade/game room, and shopping on site. Spending a day of fun is easy with the complimentary theme park shuttle. Enjoy a meal at Food Hall or snacks in the coffee shop/café. The resort also offers room service (during limited hours). Relax with a refreshing drink from the poolside bar or one of the 2 bars/lounges. Buffet breakfasts are available daily for a fee.